I am a teacher-researcher in a secondary school. I have completed my Master’s degree and hope to continue my higher education specializing in education and research. Realizing the importance and value of research in the classroom, I became interested in learning more about action research, conducting research, and writing reports based on data collected in the classroom. At present I work as a resource person in action research and Bilingual Education. 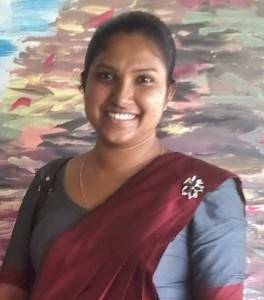 I want to improve my capacity as a practitioner-researcher so that I can enhance my classroom teaching and can be a better resource for the education community of my country, Sri Lanka, by modeling and developing a culture of research-based teaching and learning in the classroom. The objective of this practitioner-research was to determine if the new motivational and instructional strategies that I planned to implement would help create a classroom environment in which students feel safe and enjoy learning and collaborating with their peers. I wanted to create a space for all the students to express their feelings and emotions freely and openly so that they would have a relaxed mind for productive classroom activities, and for absorbing and sharing information. A series of activities were implemented to achieve the goal. For example, activities were developed for improving and maintaining healthy peer relationships and for helping students replace their inferiority complex with a sense of confidence and self-esteem. After the activities involved in this action research were completed, I observed a great improvement in students’cognitive and social behaviors. In addition, I improved my practice in working with the students. The prominent outcome I observed was the way my students enjoyed their studies. They worked hard and expressed joy through their success. They started to care for each other more and enjoyed their own qualities. They became independent in making some decisions in their projects and started to discover their hidden skills and talents to achieve success. Further, the teacher-parent relationship associated with this project led to unexpected progress in school-family relations among the families of the participating students. I came to a conclusion that creativity and commitment by a teacher can make a change in the classroom as well as in the larger community. Teacher improvement efforts in classrooms can lead to strengthened practice, more relaxed and confident students, and improved parent-school relations. The school where I conducted this action research is situated in a semi-urban area called Kobeigane in the North Western Province in Sri Lanka. It is one of the three national schools in the Education Zone and the largest school in the Education Division. It has around 1,000 students and about 60 teachers, serving Grades 1 through 13. I conducted this research with one 8th-grade class; I was the teacher in charge of this class. There were two other parallel classes in Grade 8. Of the eight subjects students learn (e.g., mathematics, science, and religion), I taught English. While some of the activities related to the planned action research were integrated with the topic of classroom teaching, some of the other activities like peer learning sessions and writing story books were done after school or during holidays. Some of the sessions were also conducted before the school started in the morning. 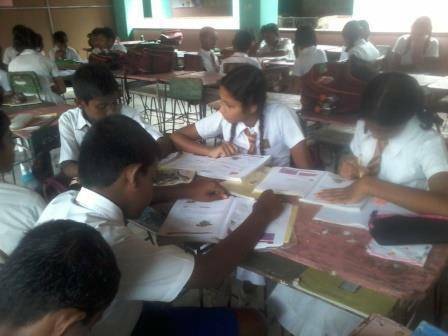 Students in Sri Lanka take various national-level examinations. After taking scholarship examinations in Grade 5, the students have to face a national examination in Grade 11. The results of this national examination will show which students are qualified to take the University entrance examination in the 13th Grade, which is called the G. C. E. Advanced Level Examination. Almost all students in this school are from families that are socioeconomically disadvantaged. While some of the parents work hard to provide their children with a better education, there are many students who have no such influence from their parents or the guardians. Since I began my career as a teacher, I have often reviewed my reflective journals. One of the major items I encountered in my journals was the passive nature of students in learning. The impression I got was that the students did not enjoy their learning. With much distressing noise in the classrooms even during the lessons, the classroom environment has not been conducive to learning. Another important element I noticed was the lack of creativity in student learning in the classroom as well as during special occasions. I also observed that many of the students experienced bullying without knowing that they were being bullied. I thought that the low performance at the term tests and national examinations, like G. C. E. Ordinary Level and the Advanced Level examinations of the previous years, could have been, at least partially, a proof that classroom environments have not been encouraging for learning. The literatures (e.g., Grubaugh & Houston, 1990; Hannah, 2013) have indicated that a classroom environment can stifle creativity or suppress positive learning experiences. Both physical elements such as wall art, arrangement of desks, or resources and intangible elements such as the energy of the classroom, the rules, or the sounds within the room are environmental sources that promote or hinder student learning and interactions. Each of these can impact student achievements and behaviors in the class. They can also affect a teacher’s attitude and practice in the classroom (Martin, 2002). Included in each of these elements of the classroom is the emotional component. The way in which a teacher organizes their class, or how they control it, will yield positive or negative consequences for their students. If a teacher is unmotivated or negative, there will be a direct impact on students in the classroom. Conversely, if a teacher is motivated and positive, they will likely have a beneficial impact on their students as well. It is important for a teacher to understand this cause-and-effect relation in order to plan classroom organization to create a better learning environment. Based on my classroom observations and reading the research literatures, I chose to conduct action-research with the following objectives to make a change in the learning environment of my classroom. In the competitive exam-oriented schedules the teachers have to deal with, caring for students’ motivation and emotion has not been attended to enough to help students become autonomous learners. Consequently, many disciplinary problems have emerged while students’ talents have not been discovered and utilized. It is a duty of teachers to help students realize that learning can be enjoyable and to help them acquire and maintain a sense of self-esteem and find a purpose for learning. In this action-research project, many components were involved. In Cycle 1, I set out to learn more about students in my English Class (N = 39). Then in Cycle 2, I determined supportive teaching approaches that I would apply based on my learning in Cycle 1, and I adjusted my teaching practice with the purpose of motivating my students to discover their talents and to become active learners. While most of the activities were done during the normal teaching learning hours, some of the activities were done after school and on holidays. Information about the students was collected through questionnaires, students’ reflective notes, wall space for free expression, and through informal discussions with the students, parents, and the teachers. Students’ reflective notes. Due to my busy schedule related to the daily routine of the school, I was unable to allocate time for each student. As understanding my students was an important component of this project, I devised a way to get my students to speak and a way to listen to their thoughts and feelings. I introduced them to the habit of writing reflective journal. Every morning they submitted their journals to me. During the day I wrote a positive feedback note in each journal and returned them to the students. Space on the wall for free expression. I pasted “demy” sheets on the classroom walls and titled them as “happiness,” “anything,” and “mirror.” Then, I asked the students to write or draw whatever they wanted on the sheets. My intention for providing this space was to let them express their ideas freely. Through the reflective writings in the students’ journals and the free writing posters in the classroom during Cycle 1 activities, I had identified their level of thinking and writing skills that I had not fully understood before (see more in the outcome section). To provide an environment for students to express their creativity, I arranged writing and public speaking workshops for my students and had them write poems and stories as a writing project. I also made their “writing project” an opportunity for them to improve their “soft” skills, such as collaborating and communicating effectively. The bilingual education students who are good in English were assigned to translate the stories into English. The following are the teaching approaches devised for this action research. Direct support for content learning. In relation to the goal of adjusting my teaching approaches to make my classroom a happy and active place, it seemed difficult to achieve the aim due to the challenge of the number of classes the students had to attend each day. The students had eight different teachers in eight periods each day. I had only one English period to work with them. I had one or two relief periods once or twice a week that I could use for the action research or for helping students who had difficulty learning other subject matters. I tried to find solutions for some of the students who were facing difficulties in technology skills or others (due to lack of teachers in some areas) by getting external resource persons, arranging peer learning opportunities, and providing extra learning materials. Making learning practical. I wanted to make the students feel the necessity of learning English to obtain the benefits of learning this language. Skype conversations with foreigners, both native and non-native speakers of English was one activity I included. In addition to the Skype practice, I had the students write letters to foreign pen friends at the beginning of the year. I observed as each and every student joined in writing the letters. When they received replies, I displayed several copies of the letters in two places on the classroom walls, and I allocated one English period to read the letters aloud for them. Giving students freedom to set learning goals by themselves. In my effort to enhance my own practice to increase the quality of student learning, I wanted my students to set meaningful learning goals. I had the students think about and write why they learn by helping them think of more unselfish and practical reasons for their learning. Then, I had them write and display their tweets in the classroom. Making the best use of curiosity during the adolescent period. One barrier I observed among my students with regard to the enjoyment of learning was blocks to free thinking. Keeping the students’ days filled with learning for and taking competitive examinations has limited their opportunities to think creatively and utilize their curiosity and openness. In order to make the best use of their curiosity, I had them research a topic in which they have an interest. Letting them shout. The school and classrooms are surrounded by irritating noises. I observed how the students were advised and asked to keep the noise down, and punished when making excessive noise even when holding the students accountable for the excessive noise of the school was unfair. What I did was to arrange a day called “shouting day” for them. Once a week for a few weeks in September, I gathered students to the main hall of the school site where the students could be isolated and could scream. Creating an effective parent -teacher relationship. As the influence of parents on children was fundamental in keeping a healthy mindset in students, I planned to maintain an effective relationship with the parents. Once every month I either met them in person or made telephone calls to know their understandings about the children. In addition, I created a reading circle for parents. I selected various reading materials and books for the parents who showed interest in reading. I sent the books from my mini library and the school library. Most of the books were about child psychology, nutritional needs of children, dealing with adolescent children, positive thinking, and successful family life. Overall, positive results were demonstrated with the new teaching approaches applied in my practice. When I made learning more practical through Skype practice and writing letters, students enjoyed speaking with real people and learned English more effectively. Compared to studying for writing answers to the questions on tests, learning in the context that students can see themselves applying in their real life seemed to motivate them to learn. Opening opportunities for students to learn new topics utilizing practical means was found as a way to help students experience progress in their learning while enjoying the task at hand. Further, when students were given freedom to set their own learning goals, I observed that students’ creativity flourished. Through their creative expression, I understood how much they cared for their own learning, manifested, for example, in their tweets applying encouraging words to themselves. When I had students research a topic they are interested in, two of the main topics they selected were the history of the school and ghosts. Through this exercise I saw that the students enjoyed their writing time more than the daily study routines. I experienced how the students developed their soft skills while enjoying their responsibilities. One of the most interesting findings was that letting my students shout helped me gain their trust. The trust I earned became a support for me when I needed students to improve their relationships with other students. While most of my students had written encouraging words about achieving their aims in their reflective journals, there were also some expressions about worries as well as verses from their favourite songs and some slang commonly used among youth. I learned things about students of that age that I had never thought about before; through the slang they used I came to understand, to a certain extent, more about their social and family backgrounds. Students in my class think about their lives and goals deeply. I thought that students were also applying what they learned in class, for example, setting their life goals by connecting them to the lesson in their English text book, for example, “Great Persons”, and then writing about how a particular person achieved their goals. Many students had written my name as their ideal person in life. I thought that the impression I created about myself with my students could have been the result of this action-research project, at least partly. These encouraging outcomes are something that I would not have had a chance to achieve if I did not conduct this project to develop my teaching practice. A wonderful outcome was an increase in positive parent-teacher relationships after applying an approach I created for this project. I gained more understanding of my students through parent-teacher meetings and sending selected books to parents. Furthermore, increased parental involvement in the work of their children was apparent in the students’ reflective journals. The parents conveyed to me the message that their children had started paying attention to school work better than before. I was happy that the students had something exciting to take home with them. The information the parents shared with me showed parents’ readiness to listen to their children now more so than before, perhaps because the parents had met with their child’s teacher. Here I share a special thing I noticed about one particular mother. This mother often added something at the end of the reflective journal entries the student wrote in the form of a letter to the child, to me, or just her reflection. This student informed me that her mother also had started writing a reflective journal. What I learned from the parent-teacher relationship part of the project was that a teacher has a power to add value not only to the lives of the students, but to the lives of parents or the guardians as well. Teachers can help make changes for the better in the society they live in. It is said by Joseph Campbell that “The job of an educator is to teach students to see the vitality in themselves” (Campbell, n.d.). I experienced that I could utilize the skills and talents of the students themselves through devotion and creativity. Through these efforts I felt and observed that my students were able to see value and dynamism in themselves. Through the process I experienced how my very objective of creating a happy and active classroom could be achieved through a concentrated effort to develop my professional capacity. Grubaugh, S., & Houston, R. (1990). Establishing a classroom environment that promotes interaction and improved student behavior. The Clearing House, 6(8), 375-378. Hannah, R. (2013). The effect of classroom environment on student learning (master’s thesis). Hannah Lee Honors College, Western Michigan University, Michigan, U.S.A.
Martin, S. H. (2002). The classroom environment and its effects on the practice of teachers. Journal of Environmental Psychology, 22(1-2), 139-156.